Attention: wine drinkers! That glass you’re swirling is a lot more important than you might think it is. For one, wineglasses must be clean and odor-free. They shouldn’t be stored upside down, as the stale air trapped in the bowl will transmit a stale aroma to the glass itself, and this affects the smell and flavor of the wine. A good wineglass will also have a stem for the consumer to hold—hands wrapped around the bowl of the glass will detrimentally warm the wine—and a bowl of clear, undecorated glass that tapers towards the top and which is sufficiently large so the liquid can be swirled without risk of spillage. Speaking of wine swirling, many consumers assume the activity of swirling aerates the wine, but the more immediate consequence is to create a film of wine that adheres to the inside of the glass’ bowl. This will make the scent coming from the wine stronger. The film increases the surface area of the wine, permitting a greater rate of evaporation. One or two swirls is enough; practice with the base of the glass on a table. So where does one purchase the right stuff? 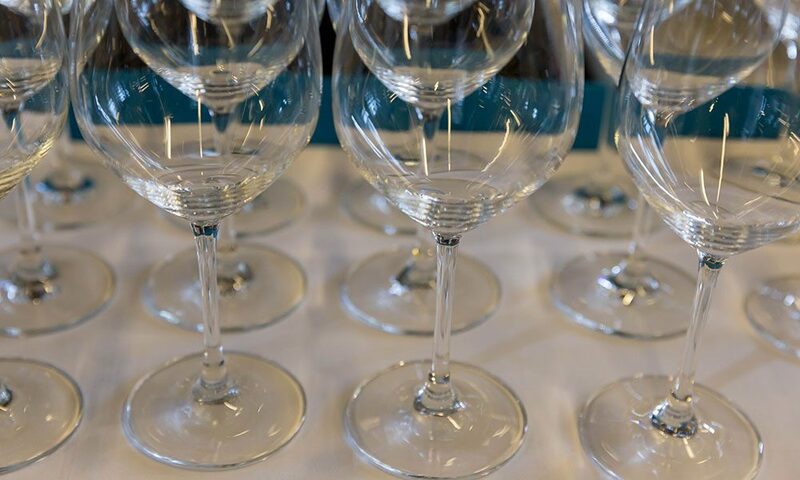 Riedel (rhymes with needle) is the best-known, specialist wine glass manufacturer, and it makes myriad differently shaped glasses, often designed to enhance specific grape varieties or wine styles. But few of us have space for multiple sets of wine glasses: better to choose six or eight glasses of one design and let them serve for both red and white wine. While the very best glasses are hand-blown and gossamer-thin, they’re much more fragile. The wiser choice might be a machine-made stem in a popular design. That way, a replacement can be easily found when one gets broken, and trust me, it will. Did you know that most wineglass breaks occur while the glasses are being dried? The risk of this happening can be lessened if the glass is dried section by section: first the base, then the stem and finally the bowl. Holding the base in one hand and the rim of the bowl in the other can have disastrous consequences: Most people greatly underestimate the effect torque has in magnifying the rotational forces applied to the rim. Don’t be surprised if the glass snaps into your drying cloth. Solution: Buy stems that are dishwasher safe, and the problem goes away. Can’t wait for next week’s wine column? Read a few of William Roach’s previous posts here and here.